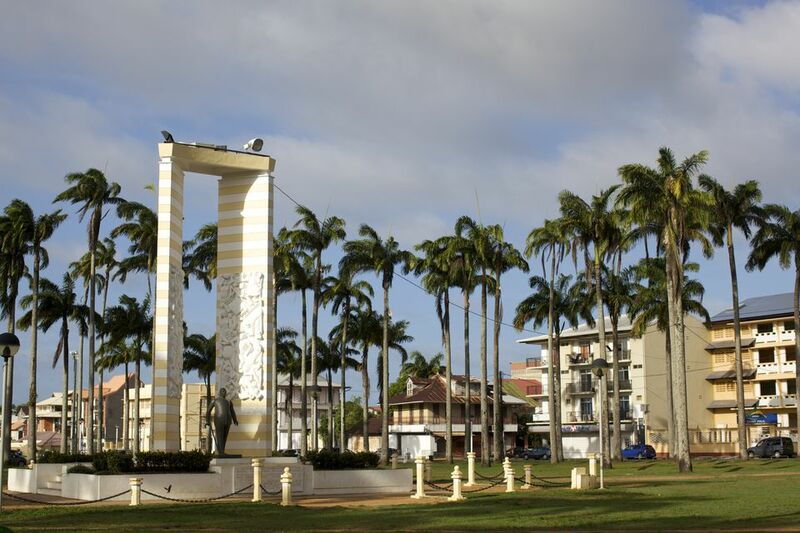 Mix a tropical climate, Creole cuisine, sidewalk cafes, gendarmes and voilà -- you have the charming mix that is Cayenne, the capital of French Guiana. French Guiana is an overseas department of France, and French influence is a major part of Cayenne's attraction. The remaining examples of French colonial architecture, palm-trees shading plazas, ethnic contributions to culture and cuisine all blend together in an attractive mix. Cayenne's location on a small, hilly peninsula between the Cayenne and Mabury rivers speaks of its importance as first a French outpost, then conflicts with Brazil and Portugal, the Dutch and the British, then again a French colony. Place Grenoble for a look at the main public buildings: the Mairie or Town Hall, the post office and the Préfecture. Place des Palmistes is in the main commercial section of town. Place du Coq is the site of Cayenne's main produce market. The Musée Départmental displays an eclectic combination of natural history, archaeology, colonial material and information about the penal colonies, while the Botanical Gardens showcase the abundant tropical plants and foliage of the region. Tour the Franconie Museum, Museum of Guyanese Cultures, and the Félix Eboué Museum, all listed as cultural sites. Finally, enjoy a varied mix of tastes and cultural heritage available in French Guiana's cuisine (and yes -- Cayenne did lend its name to the hot pepper). The French Space Center in Kourou offers tours of the Centre Spatial Guyanais. Kourou was once headquarters for the penal colony known as Devil's Island until the last penal institutions were closed in 1953. It slowly declined but zoomed into the space age with the space program. The city now boasts ultra-modern buildings. Tour Mount Favard, Ile Royale, Ile Saint Joseph, and Ile du Diable, a.k.a. Devil's Island, the Transportation Camp at Saint-Laurent du Maroni, which are all listed as historical sites, or take in a village festival to experience the varied cultures of the country. The rainforest interior of the country is best explored with a tour group. Located just north of the Equator, French Guiana has little seasonal weather variations. It is tropical, hot and humid all year round, but the drier season from July to December is a bit more comfortable. Carnaval, typically held in February - March is a major event in Cayenne. Cayenne has excellent air connections to Europe and other locations. There is steamboat service to other coastal points, such as Kourou and St. Laurent du Maroni, on the border with Suriname.